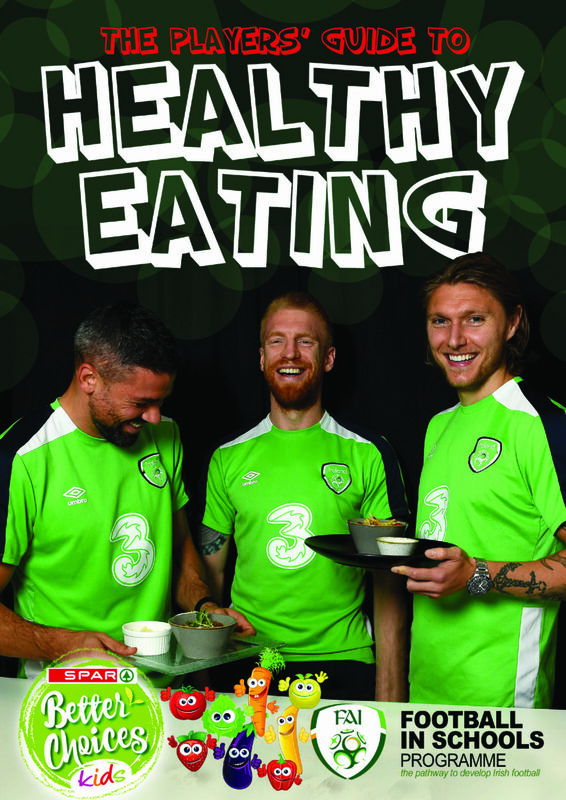 Republic of Ireland players team up to promote nutritious recipes. The Football Association of Ireland have created the Players’ Healthy Eating Guide, in conjunction with SPAR, to encourage children to adopt healthy eating habits. Eating healthier food helps children to concentrate for longer and learn more in school. It also supplies children with the energy they need to perform at their best at sport. Making smarter food choices as children will help them to grow up to become healthier teenagers and adults. Players from the Republic of Ireland Men’s and Women’s Senior Teams got involved to help out, as evidenced by the photo above of Jonathan Walters, Paul McShane and Jeff Hendrick trying out some of the meals at the team hotel. Dan Horan, FAI Head of Fitness, works closely with the Ireland Men’s and Women’s Senior Teams, so he knows all about getting players into peak condition to perform on the pitch. Dan is one of the experts in this Guide, alongside Mark Evans and Ellen Roche, who are highly-skilled and qualified nutritionists and dietitians who have helped to supply a great range of healthy breakfast, lunch, dinner and snack options. Another important person involved in this Guide is David Steele, who is the Head Chef for the Ireland teams, and he prepared each of the amazing looking dishes featured in this Guide. He also helped provide the list of ingredients needed and cooking methods required to prepare the meals.